If you’ve been following me on Instagram you’ve probably noticed a few (ahem, several) photos of Colas, our dog. Colas, which means tails in Spanish, came to us from a rescue shelter over 2 months ago and already she’s found her way into our hearts, making us melt with her soulful eyes and silly antics. She loves going for long walks and sniffing every atom along the way. And when squirrels come within her line of sight – oh boy! 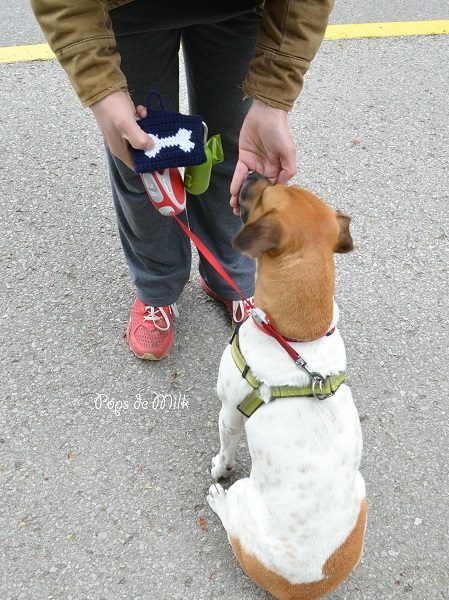 Colas especially loves getting treats during these walks (is there a dog that doesn’t?). 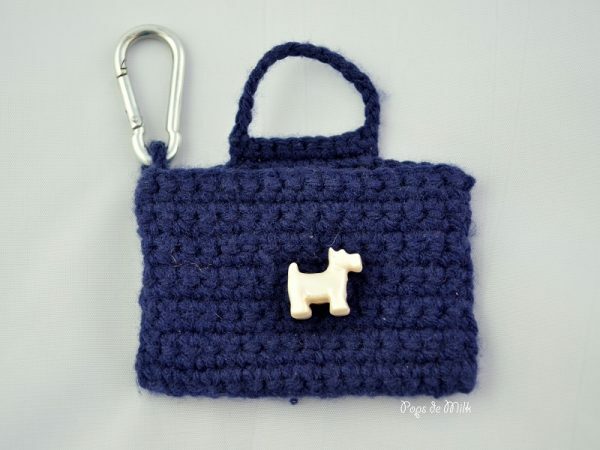 One day I noticed Jason was filling a regular paper envelope with Colas’ dried liver treats and I knew a crochet doggy treat pouch was needed. 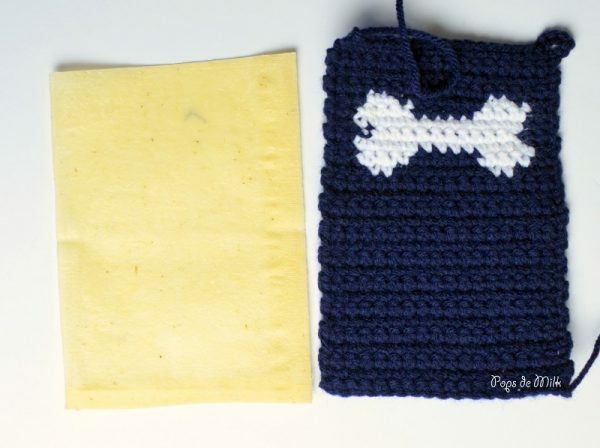 I used tapestry crochet and a pixel bone design to make the crochet treat pouch pattern. 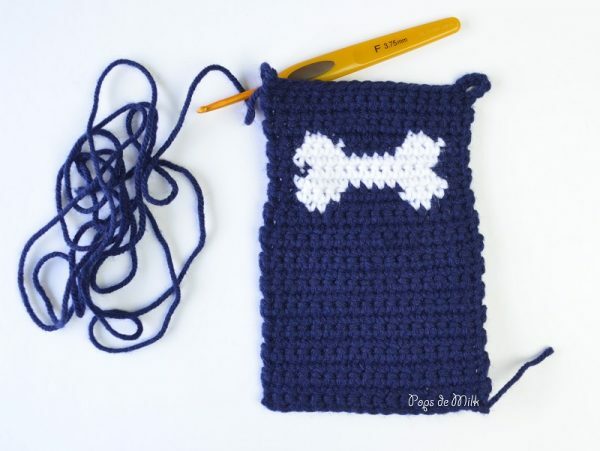 If you’re new to tapestry crochet you should check out this tutorial on how to change colours and carry yarn. 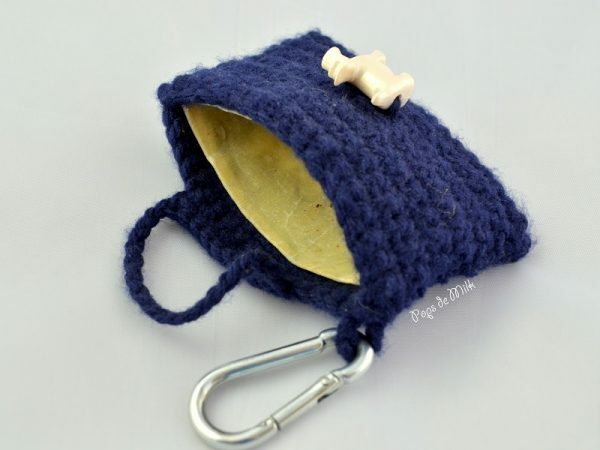 I know, you must be thinking, “What about crumbs and other food bits getting stuck in the yarn?” This is where a food-safe liner comes in handy. I thought about somehow attaching a plastic zipper snack bag inside but was not crazy about that idea. A fabric liner could work but we’d still have the same problem of potential food stains. Finally, I read about fabric that is coated with beeswax and knew this would be the best option. To make the lining I took some canvas fabric and placed it in a lined baking sheet. 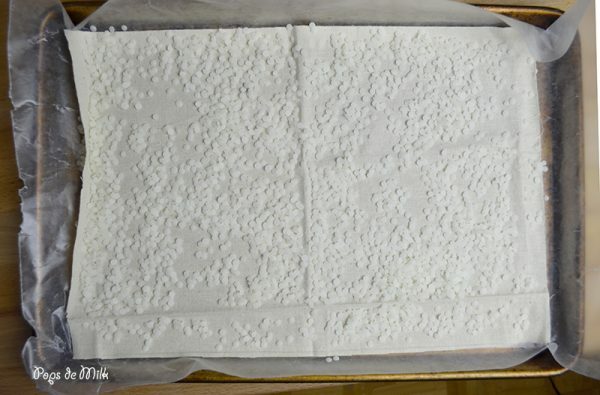 I generously sprinkled beeswax pellets over it and baked it at the lowest heat setting (170F) for about 10 minutes, until the wax was completely melted. 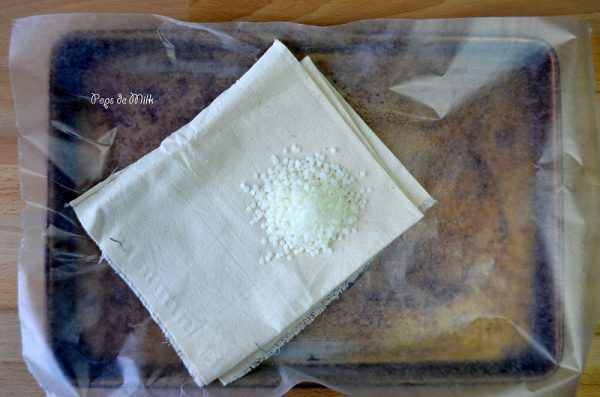 I took the coated fabric out of the oven and allowed it to cool for about a minute before peeling it off the baking sheet – yes, it will be hot so do this carefully but quickly because wax doesn’t take long to solidify. The fabric was a bit tacky for about a day or two but later became smooth. 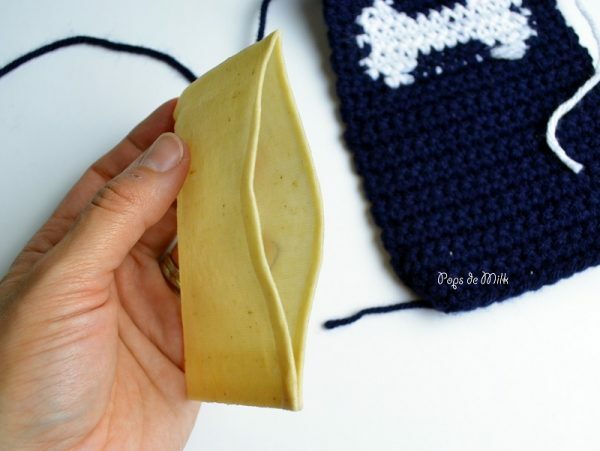 I would recommend waiting until the fabric has a smooth texture before cutting and sewing the pouch – I was too impatient and did this while it was still sticky and let’s just say I’m glad I have a surplus of sewing needles. This method creates a durable, tough, and waterproof liner that is food-safe and perfect for doggy treats. I didn’t sew the liner into the pouch so that we could still remove it and wash it when needed.